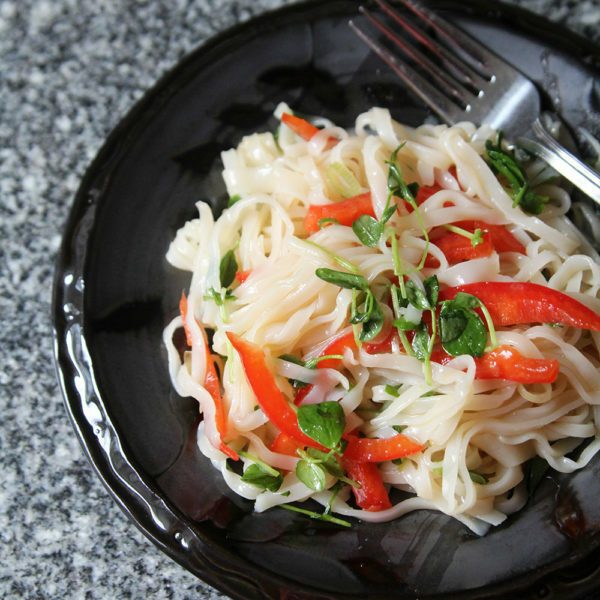 Filled with sweet bell peppers, pea shoots and scallions, this easy recipe for Seasoned Rice Noodle Salad is excellent served with warm chicken. Spring is setting in here in Maine. Well, spring as we know it. Here, the last days of March through April is known as mud season. Some call it our fifth season, actually. It’s when the temperatures rise above freezing and what’s left of the snow melts, leaving behind soft ground and water — in other words, mud. Our actual spring (you know, the kind with temperatures that can actually be called warm) will come later — in May, usually — and only last a few weeks before the long, sunny days of summer set in. And that’s the Maine that’s been iconicized as a vacation destination. Vacationland, if you will. While I look forward to those summer days, for now, I am content with tucking away the winter boots, switching to the less intense coats and enjoying brilliant blue skies that promise the warm days to come. I mean, I could do without the mud. But it comes with the territory. At this time of year, heavier dishes — bolognese, cream sauces and stew, for example — aren’t really what I want. Instead, I look toward dishes that are lighter in the belly. 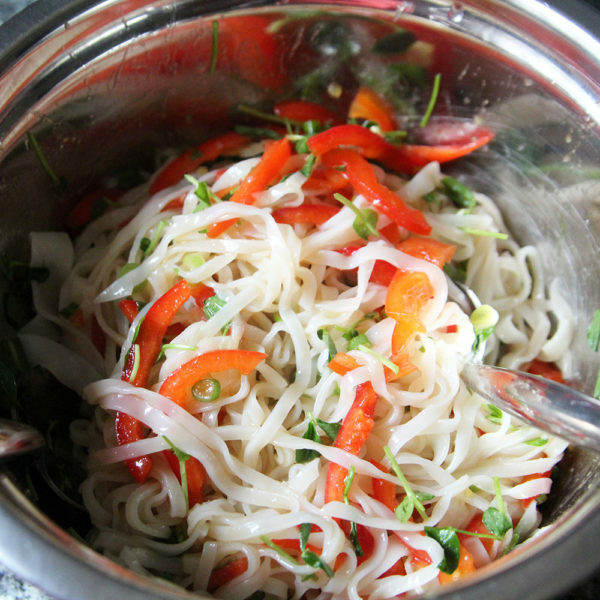 This recipe for Seasoned Rice Noodle Salad is a good example. 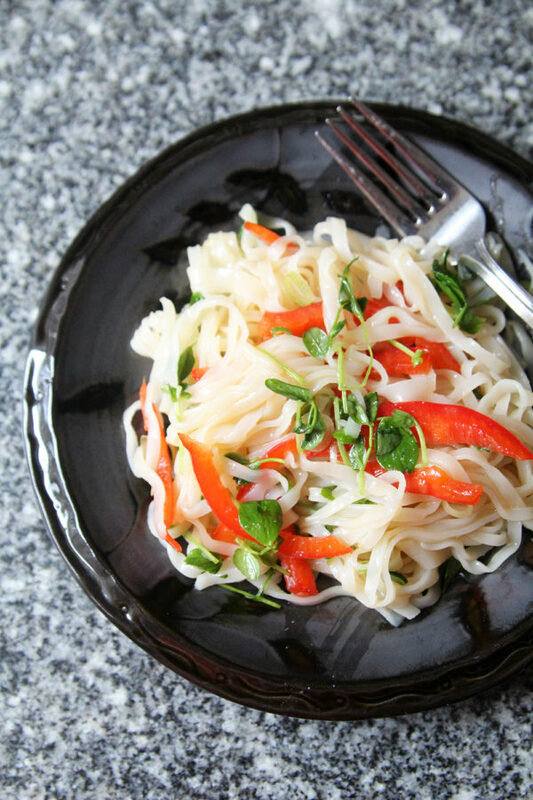 Served cold, the rice noodles are mixed with a bright vinaigrette and sweet bell peppers, pea shoots and scallions. It’s not heavy at all, but it is satisfying. I love to serve it with chicken satay and cucumber salad. But it’s also delightful served with something with bite like the Sweet and Spicy Cauliflower on The Fitchen. So good. Let’s talk about pea shoots for a minute. Have you tried them? Do you like them? They are exactly what they sound like: the young shoots (early growth) of peas. They’re a microgreen, and I find them at our local farmers market and in some grocery stores. 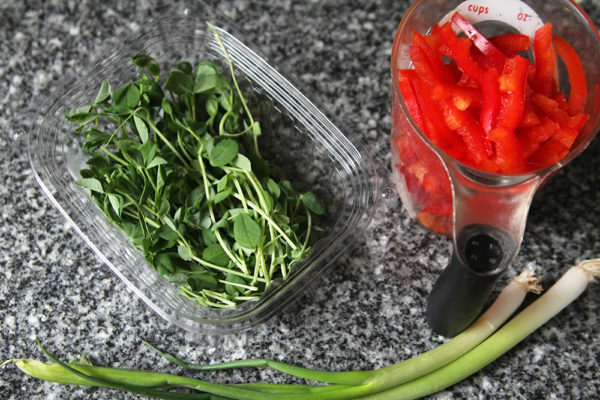 Do you eat pea shoots? I love them. With a light, fresh flavor that isn’t too earthy. We also eat them in grilled quesadillas, salads, rice bowls and sandwiches. To make this salad, begin by preparing the rice noodles according to package directions. Once they are done cooking, rinsing them in cold water will immediately stop the cooking process, leaving them perfectly tender. 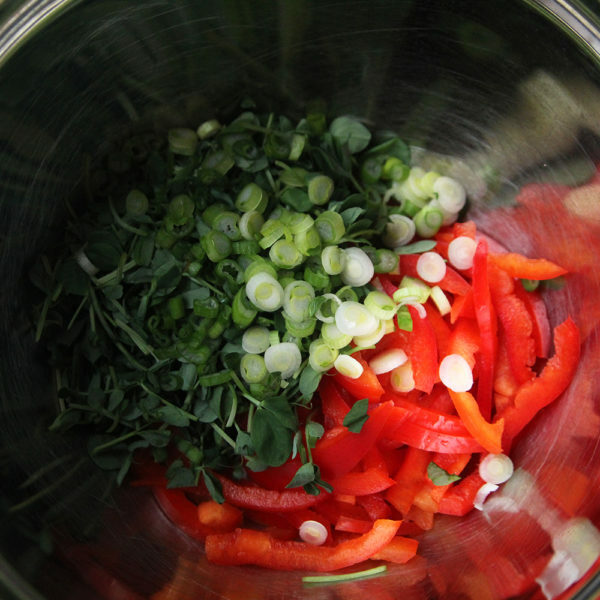 Then chop the veggies. Having bite sized pieces means they will mix well into the salad. 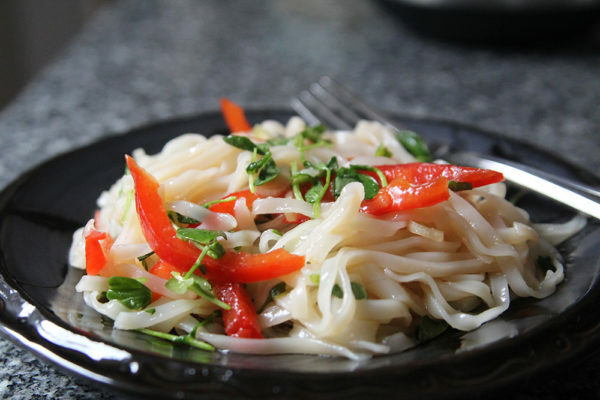 Combine the veggies with the rice noodles and then whip up the vinaigrette, pour it over the rice noodles, toss and enjoy. This can be eaten immediately or chilled until you are ready to serve it. It’s easy. It’s flavorful. And it’s perfect for this transitional season (as well as all the warmer seasons that follow). Cook the rice noodles according to package directions. Once cooked, rinse immediately with cold water and let fully drain. 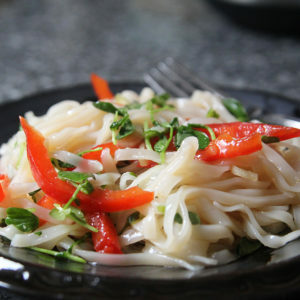 In a large bowl, combine the rice noodles, bell peppers, pea shoots and scallions. Toss to combine. 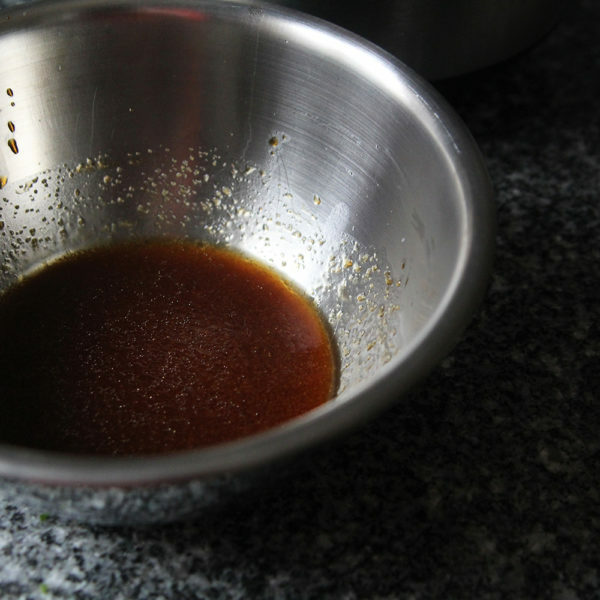 In a small bowl, whisk together the seasoned rice vinegar, soy sauce, dark sesame oil, ginger and garlic powder. Pour over the rice noodle mixture. Toss to coat evenly. I love the term mud season. I feel like that’s November through March here. Isn’t it endearing? We did an informal Twitter poll and it seems like a term mostly used in upper New England — but that could be used elsewhere too.